Next Morning Departure: If you drove to Cambridge and had your car shuttled north it will be waiting for you at the hotel. If you're flying there’s a free shuttle from the hotel to the Lewiston airport. Or you can take a taxi two hours north to the Spokane airport. The best rate we have found is $200 for shuttle service from Lewiston to Spokane by Michelle's Car service; they can transport up to 4 guests and be reached at (208) 305-5636. In order to minimize the driving time to and from the river, we start our trip in Cambridge, Idaho (two hours northwest of Boise) and end in Lewiston, Idaho. 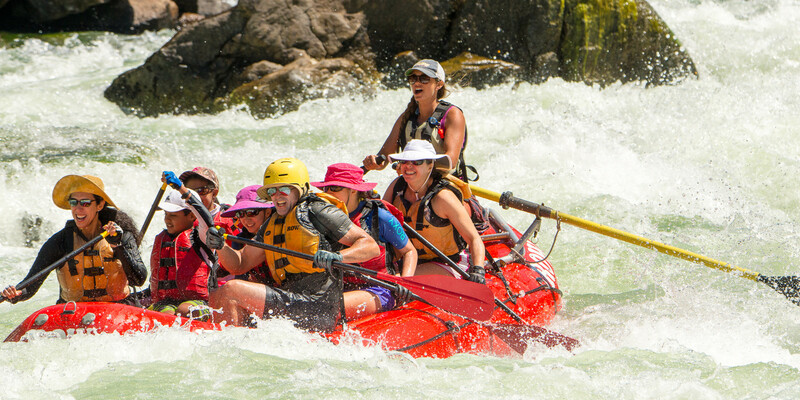 ROW provides transportation from the Boise airport to Cambridge, Idaho for the start of your trip and then to Lewiston, Idaho after the river trip. Meeting Time: Once everyone has arrived in Cambridge, we'll meet you at the Frontier Motel at 8:00 pm to give you your waterproof bags to pack, have an orientation meeting and answer any last-minute questions. This is an important meeting, so please be on time! Early the next morning (usually about 7:30 am) we leave in a van or bus for a two-hour drive northwest to our starting point at Hells Canyon Dam, arriving there about 10 am. Option A – Fly into Boise, Idaho the evening prior to your departure date and take the ROW shuttle up to Cambridge. Then after the trip return home via Lewiston, Idaho or Spokane, Washington. Arrive in Boise no later than 4:00 pm Mountain Time the day before your trip. The shuttle van (provided by Harlow’s Transportation Service) will meet you outside the baggage claim doors in the “taxi” lane at 4:30 pm for an easy two-hour drive to Cambridge. If your ﬂight arrives in Boise early in the day we recommend that you spend extra time exploring Boise rather than going to Cambridge, which is a very small town with few amenities. Rent a car and drive two hours to Cambridge. Then have it shuttled to the ending point of the trip. Take an airport shuttle from Boise to Cambridge. Contact either Boise City Taxi at 208-377-3333, Yellow Cab at 208-345-5555 or arrange an Uber. If you are unable to schedule your ﬂight into Boise by 4:00 pm or if your ﬂight arrives late and you need to arrange other transportation, the cost for this transportation will be at your expense. A) Fly out of the Lewiston Airport (Airport shuttle provided free by the Red Lion Inn) to your hometown or next destination. Lewiston is serviced by Alaska Airlines or Delta Air. B) Take a shuttle van/taxi to Spokane, Washington (two hours north) for other airline selections as Spokane has a much larger airport. If you choose to shuttle to Spokane you can arrange an Uber or use Michelle's Shuttle Service 208-305-5636. Be sure to clarify how many are in your party and how much luggage you may have when reserving with them. Option B – Drive to Cambridge, Idaho and arrange for the Frontier Motel to shuttle your vehicle north while you are on the river. Plan to arrive in Cambridge in time for the 8:00 pm Orientation meeting. On all 3-day trips and some 4-day trips, your car will go to White Bird or our actual take-out at Pittsburg Landing. On all 5- or 6-day trips and some 4-day trips, your car will be shuttled to Red Lion Hotel in Lewiston. If you have your car shuttled to Heller Bar the take out you will need a $35 discovery pass. 5- and 6-day trips end at Heller Bar, from where we transport you one-hour to the Red Lion Hotel in Lewiston, Idaho. If you had your car shuttled north from Cambridge, it will be waiting for you at the Red Lion. Our 3- and 4-day trips (except June high water 4-day trips) end at Pittsburg Landing. If you had your car shuttled it will either be at our takeout point, or it will be waiting in the town of White Bird. If it's in White Bird, we'll take you there on our bus, which takes about one hour. Typically we get you to your car in White Bird around 4:00 pm. If you ﬂew to Boise, we'll transport you by van to Lewiston, about 3 hours north. You can ﬁgure on arriving in Lewiston around 5:30 pm. We recommend that you plan to spend the night in Lewiston at the Red Lion Hotel. It's best not to plan to ﬂy or drive home that night, as you'll be ready for rest and a hot shower. As well, on trips lasting 4 or more days, we include a fun, farewell dinner. On 3-day trips, we do not offer a farewell dinner, as a lot of people leave us at White Bird and drive in different directions. If your schedule requires that you ﬂy home the same day the trip ends we'll return you to the hotel in Lewiston, from where you can get a taxi to the airport in Lewiston, which is about 15 minutes away. You should not plan on a ﬂight departing any earlier than 7:00 pm. ROW will not be responsible if you miss a ﬂight out the same evening a trip ends. We highly recommend checking the weather prior to your trip for an updated forecast and current conditions. We recommend the followinng websites. Enter and exit the raft, kayak and/or inflatable kayak on their own or with the aid of a qualified companion. Remain seated and balanced in a floating raft, canoe, kayak or inflatable kayak w/ the aid of adaptive equipment, if necessary. Swimsuit – two-piece suits are easier for women - tankinis and river shorts are a great option. One Cap, Sun Hat or Visor (ROW hats are available when you arrive). Camera – waterproof digital with extra batteries & memory card recommended. Many guests use smartphones (there is NOT cell service on the river). A waterproof case is also highly recommended for protection and ease of use. ROW provides Farmer John style wetsuits for our cold weather trips in May/June (long legs, but no sleeves). These are often worn with your polypro long underwear underneath for extra warmth. You will still need your fleece sweater and rain jacket for warmth on your upper body. Wool or fleece socks can also be worn with the booties if your feet tend to get cold. If you plan to fish, please bring your own fishing gear (with a protective case), as we do not have any to loan. The Snake River runs between Oregon and Idaho, Idaho sits on one side of the river and Oregon on the other. A fishing license is required to fish. Most often ROW will camp on the Oregon side of the river, therefore, an OREGON fishing license is best. You can pre-purchase an Oregon license by visiting the https://or.outdoorcentral.us/or/license website. Some guests will purchase both Oregon and Idaho. You can purchase an Idaho license online https://idfg.idaho.gov/licenses.